WASHINGTON (AP) — President Donald Trump told former FBI Director James Comey that he had serious concerns about the judgment of his first national security adviser, Michael Flynn, and Trump's chief of staff asked days later if Flynn's communications were being monitored under a secret surveillance warrant, according to memos maintained by Comey and obtained by The Associated Press. Trump also told Comey that Russian President Vladimir Putin told him that Russia had "some of the most beautiful hookers in the world" even as he adamantly, and repeatedly, distanced himself from a salacious allegation involving prostitutes in Moscow, the documents state. The 15 pages of documents contain new details about a series of interactions with Trump that Comey found so unnerving that he documented them in writing. Those encounters in the weeks before Comey's May 2017 firing include a Trump Tower discussion about a possible encounter between Trump and prostitutes in Moscow; a White House dinner at which Comey says Trump asked him for his loyalty; and a private Oval Office discussion where the ex-FBI head says the president asked him to end an investigation into Flynn. The documents had been eagerly anticipated since their existence was first revealed last year, especially since Comey's interactions with Trump are part of special counsel Robert Mueller's investigation into whether the president sought to obstruct justice. 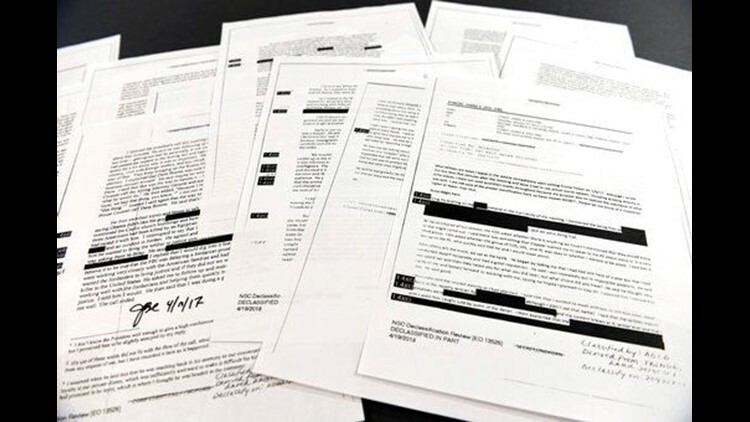 The memos have been turned over to Mueller. Comey has said publicly, "I knew there might come a day when I would need a record of what had happened, not just to defend myself, but to defend the FBI and our integrity as an institution and the independence of our investigative function." Flynn was fired February 13, 2017, after White House officials said he had misled them about his Russian contacts during the transition period by saying that he had not discussed sanctions. In a separate memo, Comey says Trump cleared the Oval Office of other officials, encouraged him to let go of the investigation into Flynn and called him a good guy. Flynn pleaded guilty to lying to the FBI and is now cooperating with Mueller's investigation. Comey said he "paused for a few seconds and then said that I would answer here, but that this illustrated the kind of question that had been asked and answered through established channels." The memos show Trump's distress at a dossier of allegations examining potential ties between him and his aides and the Kremlin. Comey writes how Trump repeatedly denied to him having been involved in an encounter with Russian prostitutes in a Moscow hotel. "The President said 'the hookers thing' is nonsense, but that Putin had told him 'we have some of the most beautiful hookers in the world,'" according to one memo. Comey writes that Trump did not say when Putin had made the comment. In a letter sent to three Republican House committee chairmen Thursday evening, Assistant Attorney General Stephen Boyd wrote that the department was sending a classified version of the memos and an unclassified version. The department released Boyd's letter publicly but did not release the memos. Boyd said the decision to allow the release of the memos "does not alter the department's traditional obligation to protect from public disclosure witness statements and other documents obtained during an ongoing investigation." Comey said in an interview Thursday with CNN that he's "fine" with the Justice Department turning his memos over to Congress.